Even Ocean City had its own march. March for Our Lives protest in Ocean City, NJ. Thousands of people marched in Old City Saturday to advocate for gun control reform during the nationwide March for Our Lives. 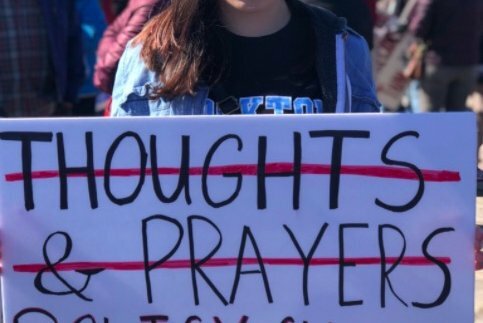 The demonstration was organized in the wake of the Parkland shooting that left 17 people, including teenagers, dead. In its flagship location in Washington, D.C., organizers estimated around 800,000 people attended. If those numbers are accurate, that would make the March for Our Lives the largest single-day protest ever in held D.C. Second would be the Women’s March, held the day after President Donald Trump’s inauguration last year, which brought an estimated 500,000 attendees to the Capitol, according to the Washington Post. In Philadelphia, one of the more than two dozen cities that held its own sister marches, turnout is estimated around 15,000 -- far surpassing the expected outcome by the event’s organizers, which had a little less than 5,000 people RSVP’d on Facebook. The march, which was scheduled to begin at 5th & Market Streets, had people stretching all the way back to at least 11th Street at its start. At the Wilmington march, attendees got a glimpse of former VP Joe Biden, who surprised the crowd by skipping the D.C. event and heading to his home state instead. “Too many children are being hurt,” he told the crowd. Just outside Philadelphia, Jay Leno made a surprise appearance at the nearby West Chester rally. Back in Philly, many people shared footage of the crowds and signs, including one of the rally’s earliest speakers, Mayor Jim Kenney. Also among the speakers (see the full list here) was Pennsylvania U.S. Senator Bob Casey, who advocated for banning assault rifles and called on Alabama U.S. Senator Mich McConnell to open up bipartisan debate on gun control to the national level. In New Jersey, more than 20 marches occurred throughout the state, including in Ocean City. The South Jersey event drew hundreds of participants, the Press of Atlantic City reported, and was pioneered by 17-year-old Emily McGrath, who attends Egg Harbor Township High School.